Lizzy Childers and Colin Ferguson plant a seedling Tuesday morning at the wetlands. The students were two of nearly a dozen Hayes students who volunteered for the event. Connor Derstine, Clint Gannon, and Jake Smith dig a hole for a seedling Tuesday at the wetlands during the project. 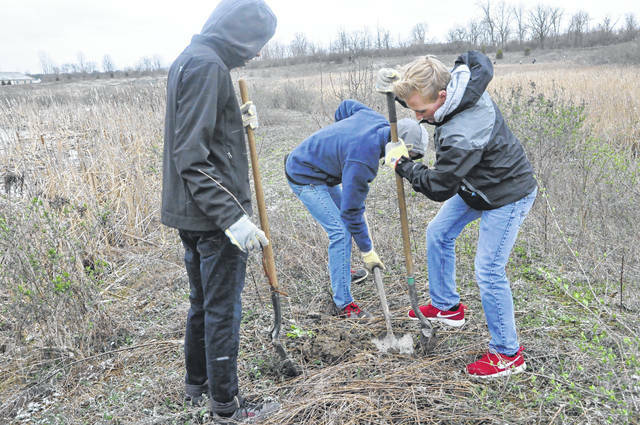 Around a dozen Hayes High School students didn’t let the frigid temperatures and snow stop them Tuesday while they helped the City of Delaware plant more than 450 native seedlings at Wetlands Park on Mill Run Crossing. City Watershed & Sustainability Coordinator Caroline Cicerchi said the seedlings were donated by Green Columbus, a nonprofit that coordinates Earth Day Columbus, as well as the Delaware Soil & Water Conservation District. Cicerchi added the goal was to plant native species and improve the wetlands. “We want to encourage land stewardship,” she said. Cicerchi added the species being planted Tuesday were red maple, common/downy serviceberry, flowering dogwood, swamp white oak and sugar maple. City Arborist Douglas Richmond said Tuesday that the species that were planted will be fine for the unseasonably cold weather. “These are common species for this hardiness zone,” Richmond said in an email. Richmond explained central Ohio is classified in Zone 6A, which means that on average, the temperature during the winter dips as low as minus 5 to minus 10 Fahrenheit. Richmond said the trees roots were never really subjected to any prolonged exposure to freezing temperatures, and they were planted quickly into soft, unfrozen soil. Hayes senior Jake Smith said students were given the option of helping out, and he signed up with some friends to better the wetlands. “We are furthering Delaware’s recreational facilities and bettering the community,” Smith said. Fellow senior Clint Gannon agreed. “It’s important to have clean air,” he said. The outlook was a little grimmer on the other side of the wetlands as Hayes junior Kaiden Murphy grabbed another seedling and carried it to a hole she had just finished digging. By 8:30 a.m., the wind chill had brought the temperature into the 20s and snow had begun to dust the ground. Murphy said she signed up for the project as a way to give back. “It’s really important to help with the ecosystem,” she said. Senior Colin Ferguson said he wanted to make the area nicer, and he felt a responsibility to help. Sophomore Lizzy Childers said she is passionate about conservation and ecology, and she was glad to help, even though she was freezing and covered in mud. “I really enjoy getting out and doing this kind of thing,” Childers said. Volunteers from Tanger Outlet also helped clean up the area and plant trees, Cicerchi added. https://www.delgazette.com/wp-content/uploads/sites/40/2018/04/web1_DSC_1495.jpgLizzy Childers and Colin Ferguson plant a seedling Tuesday morning at the wetlands. The students were two of nearly a dozen Hayes students who volunteered for the event. https://www.delgazette.com/wp-content/uploads/sites/40/2018/04/web1_DSC_1473.jpgConnor Derstine, Clint Gannon, and Jake Smith dig a hole for a seedling Tuesday at the wetlands during the project.